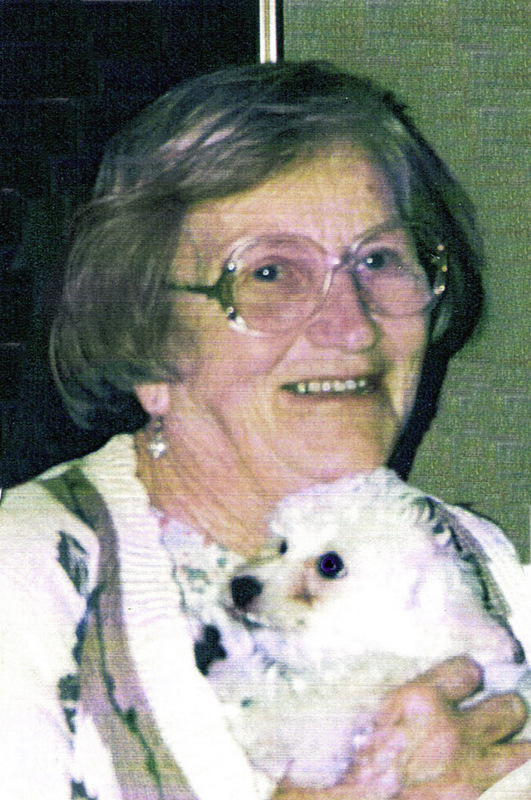 During an incredible lifetime love affair with animals that spanned 85 years, Dorothy Goodale dedicated more than 50 of those years to the propagation of a variety of dog breeds. With the passing of this remarkable woman, the world has lost the American founder of the Bichon Havanese and Bolognese breeds, as well as the Havanese and Bolognese Clubs of America. Upon learning about the Havanese, Dorothy and her husband Bert made it their mission to bring these amazing Cuban toy lap dogs to America. In 1974, they imported and restored their first Havanese to the former genetic purity achieved by the originators of the breed. While researching and working on the restoration, the Goodales discovered the Bichon Bolognese, who for the most part had remained in Italy. In 1985, Bert and Dorothy imported the first Bolognese to the United States. From that time forward, they bred the Havanese and Bolognese exclusively. 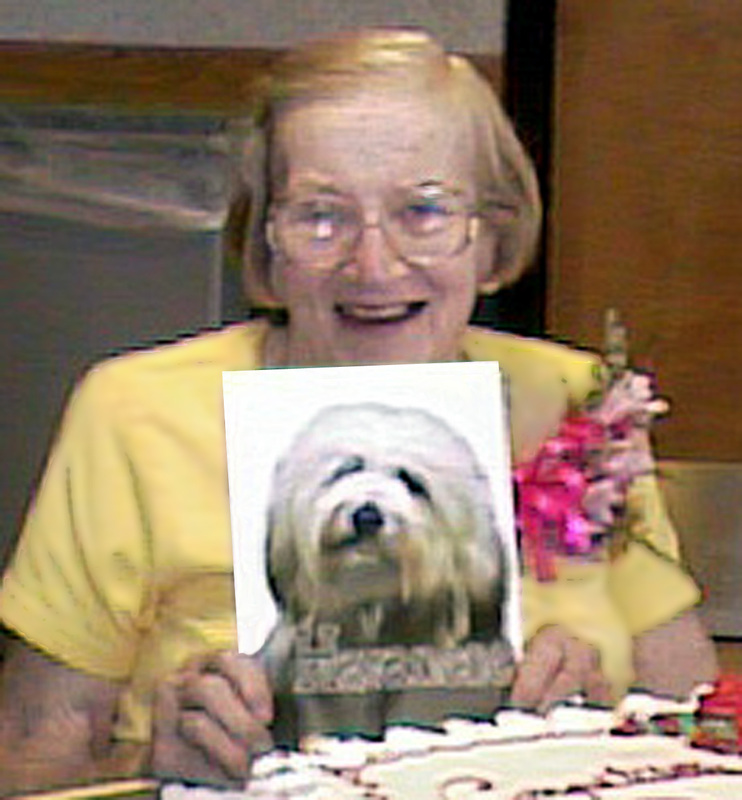 Dorothy's smile says it all at the signing of her book on the Havanese. Dorothy was genuinely caring and possessed an incredible depth, wisdom and “sixth sense” in understanding dogs. Anyone that received his or her furry family member from Dorothy instantly knew how she loved and nurtured every dog whose life she touched. Dorothy took great personal interest in the lives of the folks who adopted her fluffy treasures, and of those who opened their hearts to her in return. She was loved like family. She was always there when I needed her, from my first inquiry about the Bolognese, throughout our Blizzard’s life with us, and until his final day on this earth almost 16 years later. Dorothy enriched our lives beyond measure, not only because of Blizzard, but also because of the person she was. Dorothy was a beautiful example of unconditional love and complete integrity. She “walked her talk” whatever the issue, and expressed forgiveness in spite of her pain, even when unfairly dealt cruel blows. It’s hard to believe I can no longer pick up the phone and hear her voice just one more time. But it comforts me to know that Dorothy is in Heaven with Burt, with no more aches or pains of any kind, and with all of the precious Bolo’s who preceded her. Dorothy was an amazing woman as well as a very special friend. For my birthday, she sent me a sunbonnet birdhouse. When I called to thank her, she suggested I take the lint out of the dryer's trap and place it inside a net onion bag. By poking the bag through the bird house opening, Dorothy said I would not only be making new friends, I would be helping a nesting bird to build a comfortable home for a new family. Because of Dorothy’s kindness to animals, each time I clean out the dryer’s lint trap, I think of her. Little things like this continue to keep Dorothy in my thoughts and close to my heart. Little did I know when searching for a companion for my mini Dachshund Sophie back in 1993 that I would meet a fascinating person who would become a long term friend. My Purebred Puppy book was about to fall apart when I finally decided to go with my first inclination and contact Berdot Kennel. Right away I had a lovely note from Bert, telling me that there was a litter of 5 puppies recently born. I chose the middle girl, Thea, who arrived in a timely manner at the airport wearing a little red coat and surrounded by a bevy of airport workers. She was a wise choice because she is the sweetest dog in the world. I was so grateful to Dorothy's wisdom in picking the perfect dog for me. Five years later when Sophie passed away Thea grieved herself into a depression. More numerous phone calls to Dorothy, who was as concerned as I was. I was on the Berdot list for November, but this was July, and the only puppies available were Joy Rich's litter in Oregon. Dorothy offered me her pick of the litter puppy so that Thea could have a companion right away. I flew out to Oregon and brought Shanti back in a Sherpa bag in the plane. A fortuitous occurrence because John and Nancy Benson were there picking up Spunky (the tiny one of the litter), while I was getting Shanti (the litter heavy weight). And so another friendship. The siblings are now 10 and have not met since 98, but they are twins in looks and personality---both Dickens dogs with the sweetness seeping through their mischief. Through the years of phone chats and emails Dorothy told me so many stories of her life with Bert and early years on the ranch. I still can not think of her hiding the failed bread recipe in the fence post holes, only to have Bert come in later to get her to see the strange growth rising out of the holes, without laughing. She had so much wisdom in every facet of life; much, of course, in the dog world. She told me that should one of the girls run away and not come back when I called to sit on the ground and act like I was eating, that their curiosity would make them trot back to me. Fortunately, I've never had to use this but I surely will, should that ever happen. What a blessing to have known Dorothy with her wit, her insight, and her boundless curiosity and knowledge. I often told her what a wonderful gift she has given our country by bringing in the Bolognese and the Havanese and what brightness she has brought to the lives of so many people. We will never forget you, Dorothy. We owe so much to Dorothy. She steered us to the Bolognese and made available to us a female from the first U.S. litter in 1988. Tosca was a much loved member of the family for 15 years. Now, we find happiness and pride in welcoming Nico, one of Dorothy's last remaining Bolognese, to our family. I hope that Dorothy would have wanted it that way. I am sure that Nico will keep the memory and spirit of Dorothy alive in our household for many years to come. As we think of Dorothy and look back on our friendship, we see all of those qualities we value in good people; loyalty, kindness, ethics, the ability to stand up for one’s self in the worst of times. Seven years ago we flew to Grand Junction, followed by the drive to Delta, to pick up our beloved Scampi. From that day forward, we have been real friends and kept in touch with Dorothy, always wishing we could have been closer to help out in the tough times—and there were tough times. We wish Dorothy’s last years had been easier, but we are so proud of her and the example of the right to self-determination for the elderly that she left us. God bless you, Dorothy, as we know he has. By choosing our family to adopt Piccollo, Dorothy unknowingly changed the lives of our family and also an incalculable number of others. Piccollo, a certified Therapy dog, regularly visits nursing homes and rehabilitation centers. Because of Dorothy’s endeavors and devotion, her labor of love continues through the comfort of Piccollo’s presence. Dorothy will forever be in our hearts, thoughts and prayers. With heavy hearts filled with much love for you Dorothy, we say good-bye and thank you. During our search for a suitable Hearing Ear dog for myself, my husband and I had the good fortune to speak with Dorothy and Bert directly. Knowing a Bolognese would be the appropriate match, the Goodales led us to our beloved Noodles. With many thanks to Dorothy and Bert, upon Noodles arrival, I finally felt complete confidence in our home. Noodles was easily trained to alert me to the whistle of a teapot, a ringing doorbell or doorknocker or fire and burglar alarms. Much to our surprise, Noodles was even capable of hearing our daughter's cries and would take me to her. Noodles changed our family life for the better. When he passed away, I felt as though a part of me went with him. We know how much Dorothy missed Bert, and trust they are together once again, along with their beloved dogs and our dear Noodles. May their memories be for blessing. A couple of years ago, I had the privilege of speaking with Dorothy about the Bolognese. Her enthusiasm for the breed inspired me to purchase not one, but two of these beautiful little fluff balls - Kirby and Bosco. One for my mother (and myself) and the other for my sister. My mother's lifelong dream, of owning the dog she knew as a girl in Italy, was finally fulfilled. Although, my mother had Kirby less than a year before her passing, I will be forever grateful to Dorothy and Bert for making it possible, to bring such joy into her life, like they have to so many others. Although I never had the pleasure of meeting Dorothy in person, she was especially wonderful (with all the details), during the process of researching and buying our Angel (who is almost 5 years old). I think it is amazing that Dorothy along with her husband, brought the Bolognese to the U.S. from Italy! Dorothy will be greatly missed by so many. When Dino, our first Bolognese was two years old, I felt he needed a four-legged companion to go along with his two two-legged companions. Of course I contacted Dorothy to see about a second Bolo. After a short period of time, Dorothy contacted me. She had a lively little fellow who was Dino's half-brother. However, he had a slight imperfection or flaw, where the pigment around one eye did not fill in completely, leaving a partial pink lower rim. Since we had no intention of showing him, we were fine with it. Soon, Vinnie joined our family. We should have named him Alpha, as he was definitely that from the time the plane landed and we met. Vinnie is definitely lively and extremely loving. He has never met a lap he didn't belong in. Vinnie and Dino are great pals - We cannot imagine one without the other. Thanks Dorothy - you did a great job! I was saddened to learn of Dorothy’s passing. What is ironic, is my beloved Bolo Spencer, passed away in my arms two weeks later, at the age of eleven. Dorothy cared for our darling Spencer from his birth in August until she shipped him to us in New York that November – teddy bear coat and all. I cannot forget how excited we were to meet our little bundle of joy. Spencie did not disappoint – he turned out to be the most darling and sweet tempered little dog ever. We have cherished these past years more than we can say. Losing him was heart wrenching. His memory is forever etched in our hearts. I hope he has joined his Bolo family in heaven, and that they are all gathered around their first mommy – Dear Dorothy! I am horribly distressed over the passing of the godmother to all wonderful Bolognese. What a legacy we have to fulfill. I never even met Mrs. Goodale. I had always hoped to do just that. I hope she knew how much pleasure and comfort I’ve received and am receiving from my Boodles. I love her so much. Boodles has accompanied me to hospital confinements and is a jewel winning everyone’s hearts ....oh how I love her. To see the original site created for Bert and Dorothy click the link below.